Acclaimed director Michael Ritchie takes his satirical sword to beauty pageant culture in the 1975 film Smile. The movie takes place in the week leading up to the California Young American Miss competition, where local winners from all over the Golden State gather to compete for a chance to go to the national contest. The ensemble cast consists of the many teenage competitors, some innocent and others cutthroat, and the various adults making a living off of the commodification of their youth and beauty, including pageant staff, judges and a very full of himself Hollywood choreographer. Bruce Dern, Geoffrey Lewis, Annette O’Toole and a young Melanie Griffith bring the laughs as the pageant world is skewered mercilessly in this ahead of its time comedy. Kim Morgan discusses Smile on the New Beverly blog. Marc Edward Heuck discusses Smile on the New Beverly blog. With a superb cast and a sports-comedy, heavy weight champion of a director in Michael Ritchie, Diggstown proved that with the right pieces in place, the con game genre was far from stale. James Woods gives a passionate, slick performance, as fast talking ex-con Gabriel Cane, who’s just been released from prison. Cane and his grifting partner “Fitz,” played with sloppy charm by Oliver Platt, look to run a scam on John Gillon, a cobra of a boxing promoter and businessman (played with a steely slow burn of contempt by Bruce Dern), when they claim boxer ‘Honey’ Roy Palmer – a knockout performance by Lou Gossett Jr. – can beat any 10 Diggstown men in a 24-hour period. The angle shooting gets dirtier and deadlier, the stakes get higher, and the blood on the canvas is believable – in this sweet science of a midnight sting. 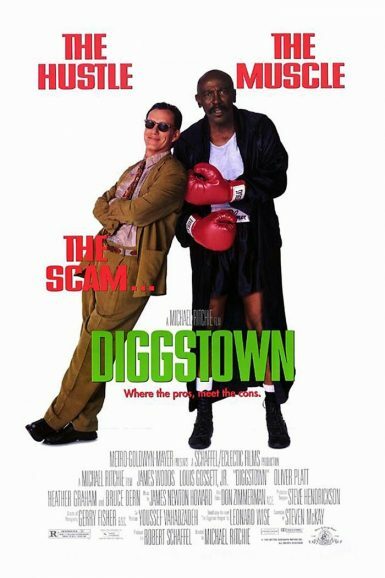 On the New Beverly blog, Garret Mathany interviews character actor Kim Robillard about working on Diggstown.